Sugar Soul Studio: 10 More Days 'til MAKE IT !!! 10 More Days 'til MAKE IT !!! 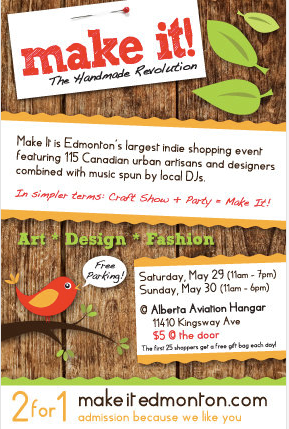 Not long now until Edmonton's fabulous spring Make It craft show arrives back at the Aviation Museum, May 29th & 30th. Be sure to line up early Saturday morning to get one of the coveted early bird loot bags full of merch and coupons for use at the show. You just might find yourself with a $10 coupon to use towards your newest Sugar Soul hat! The show runs Saturday, 11am-7pm and Sunday 11am-6pm. And for those of you not venturing out to find a rainy camp site this weekend, spend Saturday, May 22nd at the City Market on 104th Street and Jasper. We sell rain or shine from 9am to 3pm. Hey St. Albert!! Sugar Soul hats will soon be available at your fabulous farmers' market on 6 Saturdays this season. I will be there for the opening day, June 19th, as well as July 3rd, 17th, September 4th, 25th as well as October 9th. I am super excited! My booth will be #237 or #233 which are at the far end of St.Thomas Street. Make sure to walk the length of the market so you'll see me! !